Powers/Abilities: Though he had no known super human abilities, the Fixer was a criminal in charge of several men loyal to him and willing to obey his every command. Having set up a protection and gambling racket, the Fixer used his thugs to collect vast sums of money and to control the criminal element around him. The Fixer had a weak heart and was not proficient in combat himself. (Daredevil I#1 (fb) - BTS) - The Fixer was a criminal who booked and arranged fights, often cashing in on gambling debts and commanding henchmen who served his every whim. Years ago, the Fixer offered a local boxer, Battlin' Jack Murdock, a deal, but Murdock turned him down. (Daredevil II#66 (fb) - BTS) - Alexander Bont received payment from several criminals in town, including the Fixer. (Daredevil: The Man Without Fear#1) - While Fixer watched, Slade beat up Murdock at Capuzzo's gym, trying to teach him who was in charge. He ordered Murdock to act as his collector, beating up others for unpaid protection money, and threatened to kill Murdock's kid Matt if Murdock didn't comply. 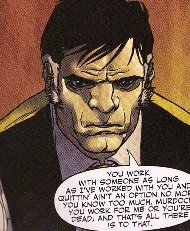 When Murdock only collected half from Morales, Fixer ordered him to go back for the rest. (Daredevil: Battlin' Jack Murdock#1 (fb) - BTS) - Jack and Slade scared Mr. Walsh when he refused to pay up, and Fixer later sent young Turk Barrett to pay Murdock his fee for working for him. (Daredevil: Battlin' Jack Murdock#2 (fb)) - Fixer sent Murdock to deal with Paulie, ordering him to break his arm if he couldn't pay up. Murdock flaked out and rushed in to the Fixer, punching past Slade and the other thugs and demanding to quit. Fixer held a trigger-happy Slade off and told Murdock that if he could sober up, they would let him box again. Fixer then sent his men to kill Paulie. (Daredevil I#1 (fb) - BTS) - Over the following months, Murdock developed fame as a comeback boxer and the Fixer ensured that Murdock kept winning. (Daredevil Yellow#1 (fb) - BTS) - Murdock was given the moniker Kid Murdock by many as his popularity increased. 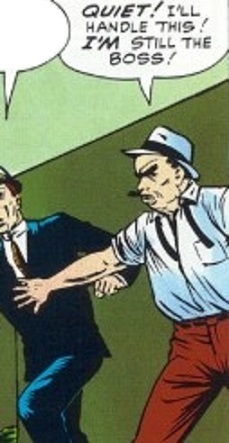 He beat Moore in the ring, and the fight was written about in the Daily Bugle by Russell Casselman. (Daredevil: Battlin' Jack Murdock#3 (fb)) - Fixer promised Murdock a fight at Madison Square Garden soon, telling him that he was getting rich off Murdock's fights, including one against Henderson, who'd been ordered by the Fixer to take a fall. (Daredevil I#1 (fb)/Daredevil Yellow#1/Daredevil: The Man Without Fear#1/Daredevil: Battlin' Jack Murdock#3 (fb)) - Finally ready to cash in on his investments, Fixer ordered Murdock to fall in his fight with "Rocky Davis" (really Crusher Creel), telling Murdock how many fights he'd arranged for him as Slade taunted Murdock about his blind son, Matt. (Daredevil: Battlin' Jack Murdock#3 (fb) - BTS) - Slade later had to approach Murdock to remind him that he shouldn't be training at the gym. Ordered not to leave marks on him, the roughed Murdock up and worked on his stomach, but a strange masked vigilante entered and fought Slade and his allies off, leaving them unconscious. (Daredevil: Battlin' Jack Murdock#4 (fb) - BTS) - Before the big fight, Slade and his men furiously approached Murdock, telling him that he would pay. They ordered Murdock to scare off his lady friend, Josie, who had bet a large sum of money on Murdock. (Daredevil I#1 (fb)/Daredevil Yellow#1/Daredevil: The Man Without Fear#1/Daredevil: Battlin' Jack Murdock#1-4) - Murdock chose to win the fight, costing Fixer cash. During the fight, the Fixer had approached Murdock when he'd nearly fallen in the ring and reminded him of the consequences if he didn't lay down as he'd agreed, but Murdock had told Fixer to go to hell. (Daredevil I#1 (fb)/Daredevil Yellow#1/Daredevil: The Man Without Fear#1) - Fixer was furious with Murdock and ordered his henchman Slade to take care of things. They met Murdock outside and ordered him into an alley. Slade and Fixer's other henchmen beat Murdock to a pulp before Fixer demanded Murdock to beg, but Murdock refused, laughing insanely after they threatened his son. 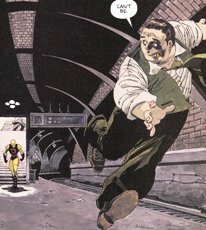 Slade killed Murdock with a gunshot, leaving behind shells of pistachio nuts, which he was well known for eating. (Daredevil I#1/Daredevil Yellow#2/Daredevil: The Man Without Fear#2) - Fixer and Slade returned to Fogwell's Gym, where they found costumed hero Daredevil with other henchmen, including Porky and Sam. Fixer demanded Daredevil explain himself, and Daredevil claimed to know about Fixer's murder of Murdock. Though Slade and Fixer initially fired on Daredevil, Daredevil managed to disarm Slade and another thug, impressing the Fixer with his skills. Slade stepped in to handle Daredevil, but Fixer ordered him to wait. Fixer then instructed Sam to call the police, but Daredevil knocked the phone out of Sam's hand. Fixer denied Murdock's murder and claimed he had an alibi. When Daredevil advanced on Fixer, Slade shoved Daredevil out the window while he confessed to the murder, but Daredevil shocked them all by jumping right back in. Daredevil ordered all but Slade and Fixer to leave and Porky and Sam gladly ran out. Daredevil revealed that he'd recorded Slade's confession. Fixer pulled the rug out from under Daredevil, then he and Slade ran for it. They mixed in with a crowd, then ducked into a subway, passing a blind man on their way (Daredevil in his secret identity as Matt Murdock, Jack Murdock's son). Daredevil followed them and the villains split up. Daredevil tripped Slade with his billy club, then chased Fixer down, dodging a trash can Fixer threw at him. Fixer then fell dead with a heart attack. Daredevil stopped a subway from running over Fixer's body, as he'd fallen dead on the tracks. 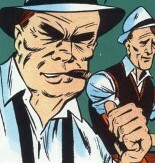 The Fixer's little-used real name was revealed as Roscoe Sweeny in Daredevil I#161. Over the years, the Fixer has occasionally popped up in retellings of Daredevil's origin. Most of the details are reconcilable with the original story, but some have to be stretched. In particular, the Man Without Fear series has some definite contradictions, such as Matt only being a kid when his father was killed, but I just relegated that to creative licensing for the purpose of this profile. The Fixer has had many different looks as well, as showcased in this profile. The only thing consistent in all his appearances is his 1930s gangster look. Crusher Creel aka. Rocky Davis is these days better known as...the Absorbing Man. (Daredevil: Battlin' Jack Murdock#3 (fb) - BTS) - Henderson was a boxer who worked for the Fixer who willingly took a fall in a fight against Battlin' Jack Murdock. (Daredevil: The Man Without Fear#1 (fb) - BTS) - When the Fixer (Roscoe Sweeny) sent Battlin' Jack Murdock to collect from Morales, Morales only paid half. Murdock was sent back for the rest. (Daredevil Yellow I#1 (fb)) - Kid Murdock (Jack) beat Moore in a boxing match arranged by the Fixer. (Daredevil Yellow#1 - BTS) - Daily Bugle reporter Russell Casselman wrote about Kid Murdock's triumph over Moore in the boxing ring.